Have you ever noticed that every time you move you need a bigger truck than the last time you moved? People love to collect things, and we have a tendency to keep collecting things in order to fill the available space in our homes (and sometimes beyond). I’m a firm believer in the idea that material possessions do not equate to happiness, so I recently started to explore the idea of living a minimalist lifestyle, to see if a less cluttered home would result in a less cluttered mind. I concentrated on decluttering each element of my life by reducing the amount of material possessions I owned and removing those that were unnecessary. This allowed me to focus on those items I valued most. Step 2: Gathered together everything I own from one category, so I could see the true extent of my possessions. Step 3: Immediately discarded anything that jumped out at me that I no longer required. Step 4: Analyzed all remaining items to identify whether I loved them. After careful consideration, I discarded anything I didn’t love or need. Step 5: This was a step where I pushed myself to be more ruthless. I questioned whether I really truly loved the things in my “keep pile” and removed a few more. Step 6: Tidied everything I had decided to keep neatly away. Step 7: Gave everything I wasn’t keeping to friends and charity shops and sent some things for recycling. We purchase many items on a whim, with little consideration of need or desire. What a waste of money to buy something you may not even particularly like! A thorough decluttering session teaches you to be more mindful of a purchase and analyze its importance before spending your hard-earned cash. When decluttering my clothes, I came across several items that still had the labels attached. I found it really difficult to part with these, as it felt so wasteful given that I had never worn them. This was a great lesson in ensuring that from now on I will only buy items I am sure I will definitely wear. Restricting purchases to only necessary items has the added benefit of saving cash. My biggest overspend in the past has been on clothes. Since I have significantly reduced my clothes shopping, I have saved a considerable amount of money. This money has helped to fund my true passion of travel and exploring the world. Reducing your possessions allows you to find items more quickly, saving precious time. No longer will you have to hunt through a stash of necklaces but easily choose one from the small collection you have retained. No fishing around among a mountain of handbags or rooting through hanger after hanger of clothes. The choice is quicker and easier. The fewer possessions you own, the less storage space you need. Since doing some serious decluttering, I now need half the space I previously did. I am currently looking to move to a smaller apartment, as I now have far too much room for one person and could happily live somewhere much smaller. Surrounding yourself with items you love and displaying only the items most valuable to you will make you feel happier. You won’t have to search through lots of items that you don’t like. Favorite items won’t get lost at the back of the cupboard or the bottom of the drawer. Gone are the days of saving your favorite things for a special occasion. Every day is a special occasion now that I am only using the things I love and my life is happier as a result. The fewer possessions you have, the neater your house will be and the easier it will be to keep clean. 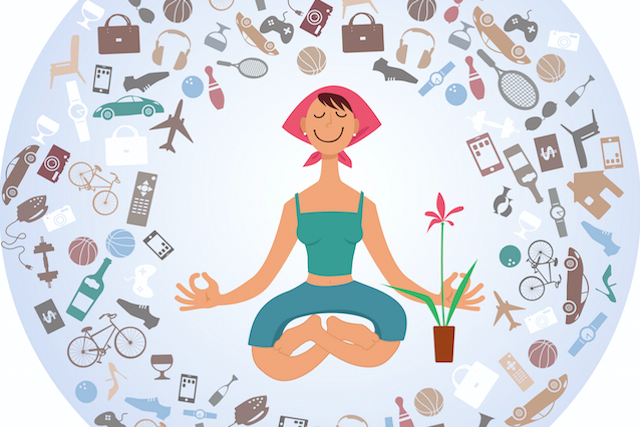 Marie Kondo, the decluttering expert, advocates the philosophy that each possession has a place and you should know exactly where to find everything. This is only possible if you reduce the amount of your material items. Now my living space is cleaner and tidier, my mind is less cluttered. As you begin to detach from material possessions and place more importance on experiences rather than things, you will sense a feeling of lightness and freedom, which can become addictive. I love this new sense of freedom I feel from no longer being surrounded by piles of unnecessary items I never use and being less attached to possessions. This allows me to focus instead on people and experiences. Now it’s your turn. Choose one category to start with and focus on the seven steps. See how it makes you feel. Try to dispose of unwanted possessions responsibly. Mel is the founder of Bestselfology, a blog that explores how to become the best version of yourself in all aspects of your life. She is currently developing a series of online learning courses to support people in reaching their full potential and live a fulfilled and happy life. You can follow Mel on Facebook and Twitter.